In March 2009 the Public Art Research Cluster at Carnegie Mellon University hosted a symposium entitled “Greening the Future of Live Performance,” organized and moderated by Wendy Arons, director of the Performance and Ecology Public Art Initiative and Associate Professor of Dramatic Literature and Dramaturgy. In May 2009 Earth Matters on Stage (EMOS) convened a Symposium on Theatre & Ecology at the University of Oregon, organized by EMOS founder and artistic director, Theresa J. May, Assistant Professor of Theatre Arts. This book extends into print these researchers' efforts to codify a significant and growing ecological sensibility in our collective professional imagination. Our relationship to the environment is an issue of urgent concern, and one that can and should be addressed by anyone engaged in critical and intellectual pursuits, including theatre artists and scholars. But despite the fact that ecological degradation will likely precipitate enormous social and political upheaval in the next century, and, with it, unpredictable and unimaginable effects on human communities and cultures—the kinds of concerns which have traditionally been prime subjects for the performing arts—theatre scholars and practitioners have been slow to engage environmental issues. As a scholarly and artistic community we have largely failed to rise to Una Chaudhuri's challenge, published twelve years ago in Theatre, to play our role in addressing the crisis of values that the current ecological crisis represents. Readings in Performance and Ecology aims at redressing that gap. 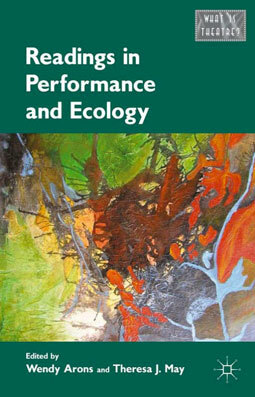 It brings together essays from both scholars and practitioners that critically engage some of the key theoretical and practical concerns about how performance has or might function as part of the transvaluation of values necessary to forestall ecological collapse. Contributions to this volume identify, illuminate, and complicate ecocritical concerns as they relate to theatre and performance, such as: intersections and complications of landscape and body; performances that participate in/reflect ecological debates; ecology, technology and representation; the cultural (de)construction of "nature"; partnership projects in the arts and sciences; animal representation on/off stage; and eco-activism/community-based performance.